Thanks to the Franz Metronome, Linda Moore's Sony, and Billy A's kind use of instruments. Recorded and perfected at Mom's Apt. 180, 510 Heritage Drive in Madison TN. Varous basic tracks and/or overdubs at Hop's Mom's on Berkley or Billy A's new mansion on Pennington Bend. Directly in the midst of the infamous LSI beatlesessions, managed and financed by Harry E. Palmer Jr.
Hagstrom electric guitar, Fender Precision Bass, Yamaha acoustic guitar, Alvarez classical guitar, Cardboard box bass drum, Fischer cabinet grand piano, Premier snare drum, maracas, tambourine, Cry Baby Wah Wah pedal, Jordan Creator sustain pedal, Realistic frequency equalizer, Maestro phase shifter, Univox echo chamber, Hi hat cymbal, extra cymbal, Sony mixer and microphones, Teac 3300 and A1500 tape decks, Panasonic cassette player, Koss and Vanco headphones, Fender Twin Reverb and Eenque amplifiers, voice. 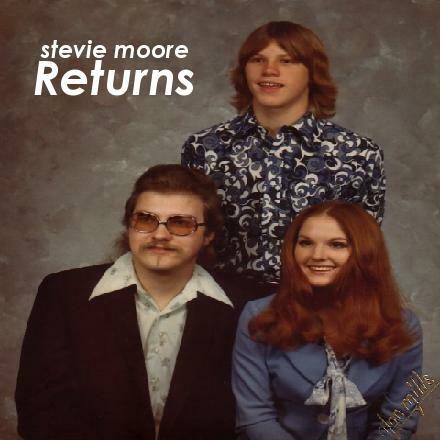 AMG REVIEW: A key album in R. Stevie Moore's early career, 1976's Stevie Moore Returns is an effortlessly eclectic set ranging from prog rock-influenced instrumentals (like the melodic, almost jazzy "Melbourne," and the colder, electronic "Magnusifence"), to scrappy little pop songs (an interesting new version of Moore's early standard, "Sort of Way," with a peculiar bongo-like drum track, or the joyous, Modern Lovers-like "Milk Shake") with plenty of Moore's patented experimentalism on display. This time out, the experiments involve an interest in funk and disco (in particular, the powerful "Everybody Is So Ignorant" works up a good wah-wah-powered head of steam), and the hilarious "Frank Jones Interview," where Stevie takes a radio station promo disc from Monument Records (the label his father, Nashville session legend Bob Moore, both co-owned and recorded for) and inserts his own increasingly daffy and desperate answers to Frank Jones' unctuous questions in place of his Dad's. The CD version of Stevie Moore Returns includes one of the more delightfully odd items in R. Stevie Moore's early catalog, The Voice/Lake Inferior, a mostly spoken word collection of surreal stories, stream of consciousness autobiography, found sounds, and tape loop experiments, like the gorgeous, mysterious "Quo Pah." Segments from the three-part "The Voice" would eventually appear on Moore's first LP, Phonography (under the titles "Explanation of Artist," "The Voice," and "Mr. Nashville"), as would "Melbourne," the soon-to-be-legendary "Goodbye Piano," and two of Moore's finest early pop songs, "I Wish I Could Sing" and "I Want You In My Life."